Reuters/Stephane MaheThe Mistral-class helicopter carrier Vladivostok is seen at the STX Les Chantiers de l’Atlantique shipyard site in Saint-Nazaire, September 4, 2014. 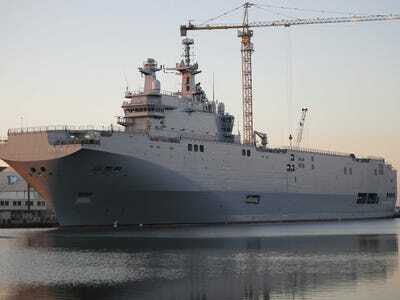 The French firm responsible for delivering the first of two Mistral class helicopter carriers to Russia is no longer picking up the phone to Russian officials, Ria Novosti reports. Delivery of the ship, the Vladivostok, has been thrown into doubt due to Western sanctions over Russia’s part in the ongoing Ukraine crisis. Last month, however, Dmitry Rogozin, Russia’s deputy prime minister in charge of the defence industry and prominent nationalist, released a letter on Twitter purportedly from French arms industry company DCNS that stated the handover ceremony of the Vladivostok would continue as planned on 14 November in Saint-Nazaire. The letter was subsequently refuted by Michel Sapin, the French Finance Minister, who told reporters that the “conditions today have not been met to deliver the Mistral“, while Yves Destefanis, a project director at DCNS responsible for delivering the Mistral helicopter carrier to Russia, was dismissed. The latest news only deepens the mystery surrounding the future of the ships. Complicating matters even further, NATO commander US General Philip Breedlove claimed on Wednesday that the alliance had “seen columns of Russian equipment, primarily Russian tanks, Russian artillery, Russian air defence systems, and Russian combat troops entering into Ukraine”. Although French President François Hollande has remained resolute in his determination to meet his country’s commitment to deliver the ships, it seems highly unlikely that France would choose to deliver them while Russia was reportedly moving troops across the border.